There's now word from the city the Golden State Warriors will have their new home at Piers 30/32 here in San Francisco and be open in 2017. While sad for Oakland, it's great news for our city to get sales tax money and have a large indoor sports arena for our city. Surely this is exciting news, but being a local resident of the city, I have fears of a big nightmare. As we all know, AT&T Park is not far away from the new arena site and if you have ever gone to a Giants home game, you know how bad traffic and transit can be. Traffic before and after games is slow or just a standstill. If you ride Muni metro to the ballpark, you know about the passenger crush loads on every single train. For Caltrain and BART, they are also busy shipping baseball fans to and from the game. But with the Warriors in town, the worst nightmare will be when both the Giants and Warriors plays on the same day at the same time. I don't think Muni metro will be able to take on the huge loads of passengers going to both games. They can't operate three car trains anywhere on the surface or subway (something about running in "tow mode"). The more trains, the better the capacity. The passenger loads are already at crush loads for Giants games. The passengers living along the T-Third line will continue to experience hell because it's both one-car trains and for many, can't get on the train to get home. There's always a backup of Muni metro trains after an event because they line-up trains on the revenue track. Passengers from Caltrain and the T-Third gets stuck waiting for trains ahead to clear-out. There's usually a back-up of inbound metro trains at Embarcadero before Giants games. Why? Muni officials holds the ballpark bound trains longer at the platform and fill them to capacity while other non-ballpark bound trains are waiting in line. I think Muni can at least start the planning stages on how to handle the Warriors crowds. Let's remember there's not much parking around the area and more will be depending on public transportation to get people to and from the games. Realign the metro tracks along the surface route nearest to have three tracks. The outer tracks are revenue tracks and the middle track can be a staging area for extra trains so they don't block regular service provided by the N-Judah and T-Third lines. Provide express bus service from Embarcadero station to Warriors arena. Find a way for Giants fans to utilize the future Central Subway while Warriors fans uses the Howard street Muni platform. Definitely more ferries with bigger capacity. Extra boarding/disembarking doors on the boats will help. 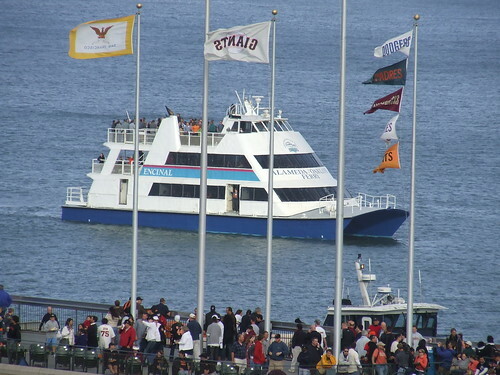 Utilize AT&T Park's parking lot for vehicle parking with a nearby ferry dock to provide frequent high speed ferry service to and from the Warriors arena. Disneyland style multi car trams to major transit stations (is that even street legal?). Bore another subway tunnel to serve the arena and ballpark. Offer incentives for people to take transit, such as buy a game ticket and get half-price fares on public transit. How about a monorail? "Monorail, monorail, monorail! Mono... D'oh!" If they're going to stack up the trains for an expected surge, why not surface them, then back them north along the F line tracks towards the ferry building? Sure, it's more work, but it'd keep the tunnel tracks clear. The Central Subway would have been the solution to this in the long term, but they have made that ludicrously low capacity too.